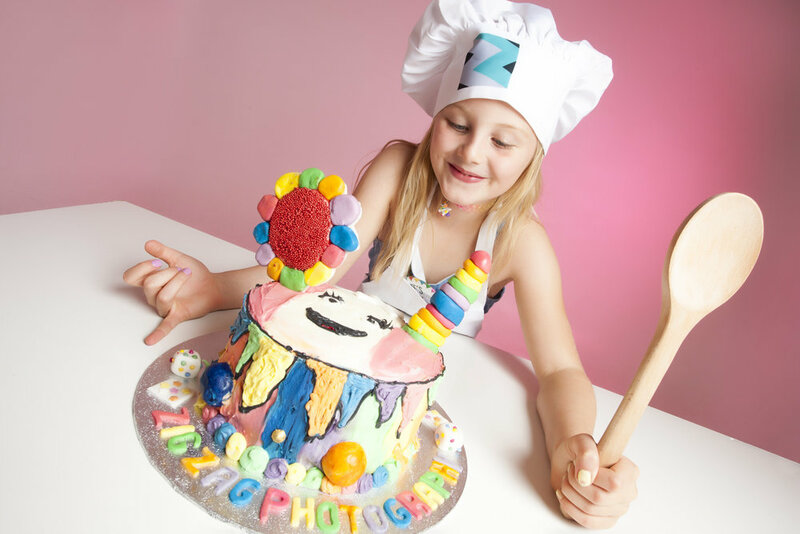 We’ve had a fun filled summer with our ZigZag’s Little Baker’s events. In total we have photographed over 600 of you and sent out over 400 key rings. We hope you all loved them! We had 5 baking hampers up for grabs with our photo competitions and would like to give a big congratulations to our 5 winners! They each won a hamper full of baking treats including a mixing bowl, whisk, jug, rolling pin, cake cases, sprinkles and more! We can’t wait to see what baking goodies they create. We’ve also had a very exciting competition running with our friends at Jones’ Cafe Bistro. They are just round the corner from us on Queens Road, and not only do they do fantastic breakfast, lunch and dinner but they also make amazing cakes! They make a great lunch spot to refuel after a fun photo shoot with us. You should definitely check them out. The winner of our ‘Design a cake’ competition would receive their design perfectly recreated for them by Jones’ Cafe Bistro. 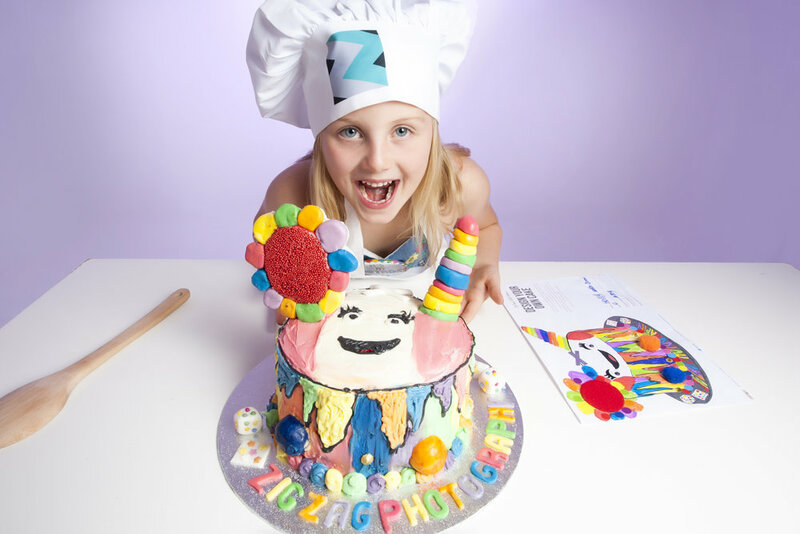 They would then get to come into the studio, to don our ZigZag chef hat and apron where they would be presented with their cake for a mini photoshoot and a framed portrait of them to treasure long after the cake was eaten. As you can imagine, with such a fantastic prize, interest was huge and we’ve had so many great entries. We’ve had dinosaurs, rainbows, stars, emoji’s, unicorns, cats, bumble bees, cherries, waterfalls and dogs just to name a few and we also got covered in the abundance of glitter used on several of them. It was such a hard choice, that we couldn’t possible judge it and we left it down to Camille, the very talented baker at Jones’. After much deliberation she chose Holly’s fun, fantastic, colourful face design. With pompoms, sequins, spots, a huge flower, a unicorn horn, eyelashes, a lovely smile and even a bow in it’s hair - it had so much going on, we knew it was going to be a big challenge to recreate. We called Holly’s mum to let her know the good news and book her in for her cake presentation. We were very excited waiting the almost two weeks to see the cake. But Holly was booked in ready to receive her cake… on her birthday! It couldn’t be any more perfect! We had a quick sneak peak before Holly arrived to compare it to her design and it was perfect! No detail was missed, from the black outlines to the 3D vs 2D cubes. Every bit of colour was replicated faultlessly. Holly arrived full of excitement on her 7th birthday! She was so pleased to see her cake come to life and we got some scrumptious photos of her to remember, what we hope will be, a very memorable birthday indeed!